After Parvati Shallow graduated from college, she wasn’t sure where to go next. Then, CBS producers asked her if she would like to compete in the reality TV show, “Survivor”, in 2006. 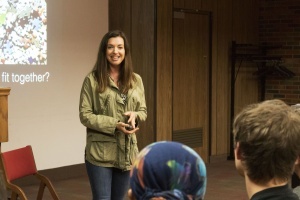 Shallow spoke to Youngstown State University students on April 11 about how to overcome fear and uncertainty. She said people must take a step towards their own happiness instead of doing what others expect them to do. Hosting a travel show was a dream of Shallow’s, but she took a public relations job after she graduated college instead. She quit after three months and started applying for reality TV show competitions. Shallow, who is also a former boxing competitor, auditioned for the reality TV show “The Amazing Race” and wasn’t selected, but the producers wanted her to compete in “Survivor.” She said people need to understand their goals and limits before they pursue their goals. YSUrvivor invited Shallow to YSU to give the lecture through CAMPUSPEAK, an organization that brings speakers to campuses. Sarah Davis, president and founder of YSUrvivor, said she was pleased with the turn out. Andrew Zack, a senior YSUrvivor participant who attended the lecture, said Shallow had big shoes to fill and delivered well. YSUrvivor is a student organization inspired by the show, forming tribes and competing in challenges every semester to determine a winner. Shallow said she was invited to partake in a puzzle challenge before the lecture, which impressed her.